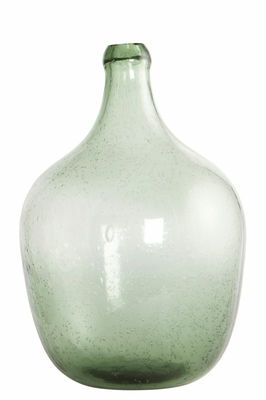 This elegant mouthblown glass vase offers a contemporary interpretation of the old bottle. This manufacturing process gives small bubbles and irregularities in the material, which makes each piece unique. Because it is solid colored, the light green glass that constitutes this vase will keep its nice shade over the years. It is perfect to hold some flowers but will be also noteworthy as a decorative element.